If you have a pond near your house, it's probably a popular stop for geese. They're drawn to open spaces close to water, and enjoy dining on the natural grass and seeds from the plants growing around the pond. It's a goose's idea of a dream home to raise a nest full of goslings. 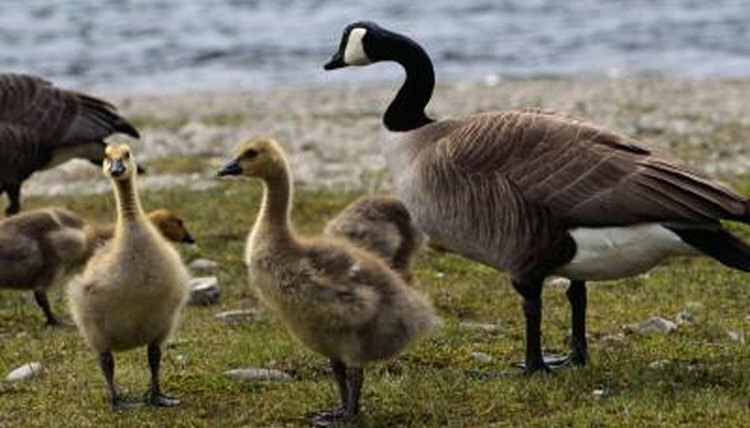 Build a nesting box or two to welcome goose parents to the neighborhood and encourage them to stay long enough to raise a family. Divide the sheet of plywood into six 2 foot by 2 foot pieces, using the tape measure and pencil to mark them off. Cut the plywood into the 2 foot by 2 foot pieces along your pencil marks with the saw. You only need five of the pieces, so discard one of them or set it aside for another project. Line the edges of two of the pieces up so that they form an "L" and screw them together using the drill and three screws. Along the edge where the two pieces meet, place one screw at the top, one at the bottom and one in the middle. This creates one corner of the box. Attach a third plywood piece to one of the sides of your corner piece. Use three screws placed at the top, bottom and middle of the adjoining edge to secure it in place. This will form a three-sided box with an open front. Put the fourth piece of plywood in place to make your three-sided box into a four-sided box, closing the front opening. Secure it into place so that it is attached where it connects to two sides. Insert a screw into each top corner, each bottom corner and the middle point of the edges of both sides. Lay the box on one of its ends so that the top and bottom are open. Place the bottom piece -- the fifth piece -- of plywood on top of the four-sided box and attach it to the sides using the screws and the drill. Drill a screw through the bottom piece and down into the sides 1 1/2 inches to the right and left of each corner as well as one in the middle of each side. Put the drill bit on the drill and make five holes in the bottom piece of the nesting box to allow water to drain out. You don't need to mark or measure them, just place them randomly.  You can put the nesting box on the ground near the water, or you can attach it to a pole to elevate it.  A simpler nest can be created using a the bottom of a 55 gallon drum or a washtub that is at least 2 feet in diameter and 10 inches deep. Just drill the drainage holes into the bottom of the tub and secure it with screws to a wooden pallet.